*This is a diary post, so it will not include helpful links. I will do another post for that. It was April 2018 when my husband got word of a position coming available in Vicenza, Italy. I was in Peru on a mission trip at the time. When I returned my husband mentioned the opportunity that may be ahead for us. Although, I was in full agreement I didn’t show my excitement. The reason being, he had previously mentioned taking a job in Germany and when I showed my excitement via email he quickly responded with a NO. Insert sad face. Again in June, he brought up Italy. He said he had been waiting on me to tell him if I wanted to go, I quickly replied with a resounding “yes.” By August, the application and resume process was in full swing. We still weren’t 100% sure he would get the job, but we both had peace about leaving Hawaii. From August to December it was just talking about going. Because we had received a “confirmation” in October, we began selling things and giving away stuff just to be prepared for what may come. Orders needed to be in our hands before we knew it was a done deal. December 4, 2018 we received orders. (If I were super blogger savvy I would have a surprise photo to insert here.) It was official at that moment. Then came the question, “do we rent or sell the house?” I was up for selling, but he wasn’t. So, I found a property manager who would take the stress and cares of our house off of me. The fee would come out of our own pocket (vs. rent), but stress free is key (within reason). Today, we are one month in Italy and I’m feeling good about renting. Hopefully, if or when we return, our house will still be intact. December was loaded with ‘things to do’ such as: school finals, schedule movers, book flights, meet with property manager, go off-island for two weeks during the holidays, and figure out what all is involved in PCS’ing to another country. I downloaded PCS checklists and I had plenty of documentation on PCS’ing that people had sent to Felise. There is a lot to know about your origin per diem, lodging, etc. and the host country per diem, lodging, etc. They are different and if you’re new to this, it’s a lot of information to take in. I spent January checking off items on the checklist, taxes, school, painting, submitting for change of address, getting official passports, photos, Visas. Oh my - so many things. Thankfully, we did have documentation on the process and Felise’s future co-workers helped tremendously. The pre-packing had begun. I felt it necessary to pack my own clothes (delicates), put all wall decor in one place, all bathroom things in one place, and all bed linens and curtains in one place. It’s not like I’ll have the exact same setup in Italy as I had in Hawaii. It just made sense to me. The movers were scheduled for February 4th to pickup our unaccompanied household goods. They would return on February 6th to get the rest. The movers came, did their jobs and finished a day early. We slept on the floor that night. The next day began our stay at the wonderful Hyatt Place Hotel in Waikiki while we were in between moving out of the house and departing. I must tell you that Hyatt Hotels are my most favorite of all. When I’m old, I want to live in a Hyatt Hotel. If you know how I can set that up, let me know. The day came that we left the beautiful shores of Hawaii for a new home in majestic Italy. From Sweet Home Alabama to the Aloha State of Hawaii to ITALY. I’m not even going to ask “what’s next?” because I just want to live in the moment. It was not hard leaving Alabama for Hawaii, but it was emotional leaving my friends in Hawaii to come here. Nevertheless, I was more than happy to have the opportunity. When I was planning to come here, I decided I want to live a deliberate, simple lifestyle. Hawaii was so expensive and I’m so frugal, it was hard for me to enjoy it the last year and a half. The first week we were here we stayed at the inn on base (Caserma Ederle) to get our bearings about us and check-in. Ederle Inn is nice and convenient. We didn’t hear great things about it, but it was fine. We’ve completed 90% of our in-processing but are still looking forward to the next thing - receiving household goods and the car. Currently, we are staying in an Airbnb and will be in temp lodging until we find a home. When the movers arrived to our house, I felt as though I could throw up and jump for joy. My neck had a rash from the stress. It’s weird that my body reacts physically, not emotionally. I never “felt” stressed, but my body said “you’re stressing.” When I’m organized, I’m at peace - spiritually and emotionally. I don’t know how it happens, but that’s the best way I can explain it. Now that I’m here, some days I have to force myself out of the apartment. My excuses are it’s cold (35-50 degrees), I don’t speak the language, or I don’t need anything. This has only happened maybe three times in a month. I still feel it’s important to acknowledge those feelings being it’s my first time living abroad. I’m by no means sad. #1) I have Jesus. #2) I have my husband. What more could a lady ask for? If you’re looking to move to another country, I encourage you to acknowledge such feelings and determine why you’re feeling them. Maybe it’s just laziness, perhaps depression, or possibly the enemy wanting to keep you isolated. The best thing you can do, is get your bible reading in, then get up and go people watch at the very least. We’ve already made several new friends. I mean good ones that are fun to travel with. 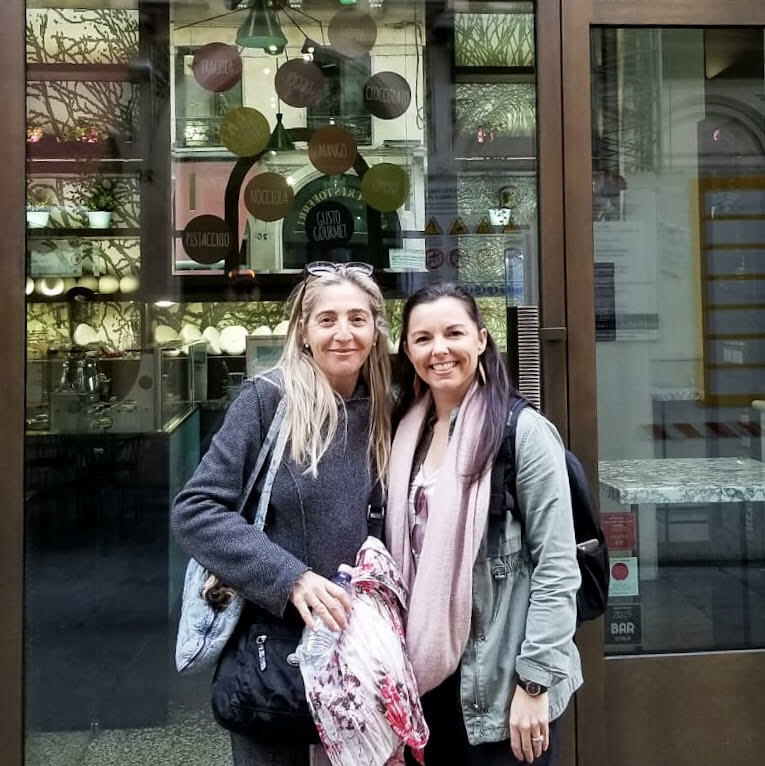 Felise and I visited Verona, a few farmer’s markets, and participated in a 7K camminata-volksmarch (non-competitive fitness walking), and went with friends to Venice for the Carnival. The base offers a lot of recreational activities and tours. Every weekend there is something going on within an hour’s drive. We will have no problem making the most of our time here and meeting more people. Before arriving, Felise’s co-worker recommended a realtor to help us find a home. It’s so funny because I was watching a HGTV episode filmed in Vicenza a few months ago. The realtor’s name on the show was Francesca. I said to Felise, “what if that’s the same Francesca that will be helping us?” We kind of giggled and moved on. We got here, met her, and I didn’t even realize it was totally the Francesca from that HGTV episode. She brought up the show and I remembered mentioning her to Felise. We were ecstatic! How funny, right?! If you are moving here, I highly recommend her. She is now my local friend. Visit her site. I’m certain we’ve looked at 20 places in a month; in and out of town. We have now settled on living downtown. Here are a few reasons why and I urge you to consider the same things when deciding on which area to live. We plan to have one car. We heard oil changes are like 400€ because the cost of oil is outrageous here. No second car necessary for Team Ropati; we will ride bikes, bus, train, walk and use the car as needed. Downtown is close to Caserma Ederle (8+/- minute drive time) so bus and biking are convenient. There is a no traffic zone downtown, so it’s walker and biker friendly also. I will be in online school all year, i.e. at home a lot. If I need a break from schoolwork, I want to walk outside and be at the grocery store, the park, people watching, etc. within a few minutes walk. If we are living 10 minutes driving time outside of downtown, in a small community, I may never leave the house. I like interacting, people watching, and street photography. Furthermore, if hubs is gone on a work trip, I don’t want to be out there by myself. Some of the stand alone houses outside of the city are large and require yard work. I want to be free of things we don’t enjoy. Yard work and loads of housework will definitely hinder our traveling desires. I do not want that burden while living in Europe. The apartment we have claimed is a flat, top floor, in a building with no yard but overlooking someone else’s beautiful garden, and downtown. Minimal housework required. Lastly, if we get the apartment we are hoping for, we will be within walking distance to the train station. Also, within walking distance to the bike path, great restaurants, markets, shopping, and grocery stores. This is much more pleasing to me than living outside of the city, given our current situation and desires to travel as much as work, school, and money will allow. I must say, we saw some stunning places outside the city. If we were living here forever and had two cars, then I’d be all over the farmhouse we saw. It’s almost easy to say, “we’ll take it!” But I had to think about reality and the time we are committed to being here. Now, I know things change and we could be here longer than three years, but at this time it’s three. That’s what we will base our decisions on until we know different. I mean - we didn’t think we’d leave Hawaii for crying out loud and here we are. Do NOT expect an American house in Italy. Do not rule anything out, or in, before seeing it in person. I suggest getting a realtor for expert guidance. They are very knowledgeable on the communities, know landlords, and it’s a great way to make a local friend. I did some research on contemporary Christian services before leaving Hawaii. There are only a few in this area. The base offers a worship service, gospel service, and a contemporary service on Sundays. We attended the worship service a couple of weeks ago. It was a pleasant experience but wasn’t sure it would be our home church. As I was registering for my Italian class, the adviser asked what my degree was in. I told her Biblical Studies, then she gave me a flyer and invited us to the church she attends - Glace Community Church. I looked it up and realized I had seen the website before. I continued reading about their beliefs and service information. I listened to a sermon on YouTube and decided we should visit this church. The bus stop is a 15 minute walk from the church. It didn’t appear there was a sidewalk the whole way and I certainly didn’t want to pay a taxi. Not knowing the streets or traffic status, we opted out of going last Sunday. However, we did watch the livestream. As we watched, I sent a message via Facebook to ask about getting there from the bus stop. Whomever replied said they have a couple who has walked it numerous times and thought it would be safe. Felise and I feel like this could very well be our home church. We are excited to attend and see how the Holy Spirit moves. I’ll come back with an update next week. Keep an eye out for updates and more diary entries………..the story doesn’t end here.